This entry was posted in Race Results on May 18, 2009 by WSG. Ms. Amy Sproston returns to Massanutten to defend her title, mission accomplished!! Amy was running an incredible pace all day and won in a time of 24:59:55. Amy mentioned she was cooked for the last two climbs and still rolled to victory after surging all day and night! As far as the men hats off to Mike Mason who ran a incredible race just 20 seconds behind Redpath for a 3rd a place finish..20:43:04! Nice run on the wet rocks both Amy and Mike!! Way to go Goats!! Full Wasatch Speed Goat race reports to come! Then there’s Mr. Meltzer who just posted his 24th 100 mile victory, congratulations! Karl mentioned he wanted to run 18 and 1/2 half hours, his time was 18:29:57 !! 10 scrapes! This entry was posted in trail shoe review on May 7, 2009 by WSG. When I think of all the trail shoes I ‘ve used over the years there are two models that really made an impact on trail running. Remember the Nike Terra Torre? Killer trail shoe from the early 90’s and of coarse the One Sport which became the Montrail Vitesse. 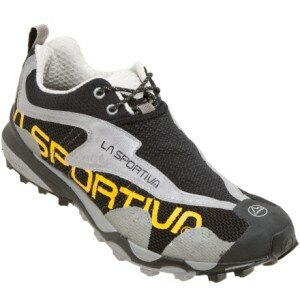 Well now there’s the La Sportiva Crosslite, this shoe is by far the best trail shoe I have ever run in, keep in mind this shoe works well in the rugged Wasatch Mountain Range. The Crosslite has a beefy sole with lugs that provide super traction and support to bomb down the nastiest scree field you can find. The shoe fits so well your foot doesn’t slide around and give you toe bang like the floaty boaty Montrail Vitesse. The upper portion of the shoe has a real light breathable material that allows water to drain quickly after crossing those creeks. Looking forward to trying the Crosslites at the Pocatello 50, Bighorn 100, Wasatch 100, Oil City 100.